A sweet blend of tropical fruits including banana, papaya, green melon and pineapple. 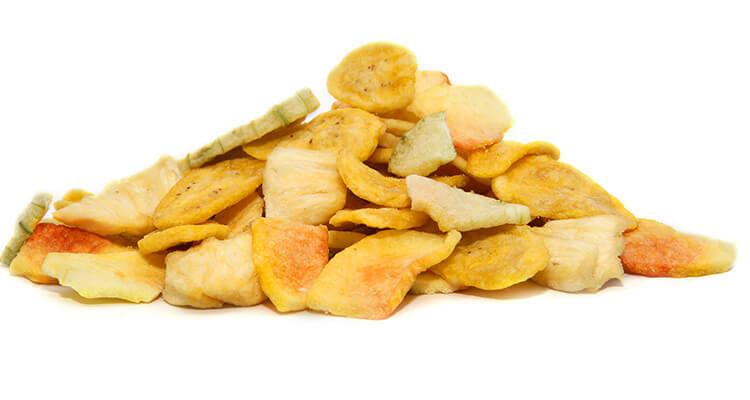 The fruits are processed using the same manufacturing technique as our current product vegetable chips. This enables the chip to retain their natural colour, flavour and most of the fruits nutritional value! Fruit (88%) (Banana, Papaya, Melon, Pineapple), Canola Oil, Dextrin. Contains sulphites. May contain traces of egg, gluten, milk, peanuts, sesame seeds, soy and tree nuts.